My hooded sweatshirt was from winning the State Championship. It was a very rainy day and our uniforms were caked in mud. I got some nasty bruises and I was sick for two weeks afterwards. But we beat the Bengals 32-7 and the whole team was estatic, we were non-stop excitement the whole ride home. The bus driver had to pull over on the side of the road twice to try and get us to stop singing and jumping. The hoodie is now a little worn, the bright blue is faded and there’s a hole on one of my elbows. I worked hard and long and didn’t get enough sleep for months so I could afford my couch. The job isn’t pretty, and it’s not air condioned. Some days I feel like a mindless slave, I’d do anything to get back on the field and punt a football. The couch very comfortable. Fine black leather with deep cusions, sitting in it is more like melting into a pot of soft bunnies. I keep an extra blanket and decorative pillows there for the late night videogame binges. But there, tonight on my couch lays a girl wrapped in my state championship hoodie. All of my hard work, keeping a girl sound asleep. Tired from her own long day. Her hair has fallen in her face and I think to push it aside, but for now I’ll let her sleep. I’ll think instead how this is my greatest accomplishment. A while back, my and my dear best friend Clarissa were talking about a picture she snapped at a park. A single rose laid on a bench. We talked about the meanings behind it and where it came from. Our conversation led to an epiphany. She’s a poet. I’m a writer. We should both take this rose and write about it. First up, I have her beautiful take on the picture. It’s Sunday evening, and I want to spend some time with my boyfriend. I put some vegetable trimmings in a plastic baggie and we head to the park. I want to feed the ducks, he wants to play pokemon. It’s a good compromise. It rained earlier, so the ducks are digging in the ground for worms. I share from my baggie with a little girl who seems more scared of the ducks than anything else and then we walk a loop around the pond. One of his hands is in mine, the other holds his phone. He almost catches a squirtle, but it breaks out and runs away. We walk up through the rose garden, underneath the arches. 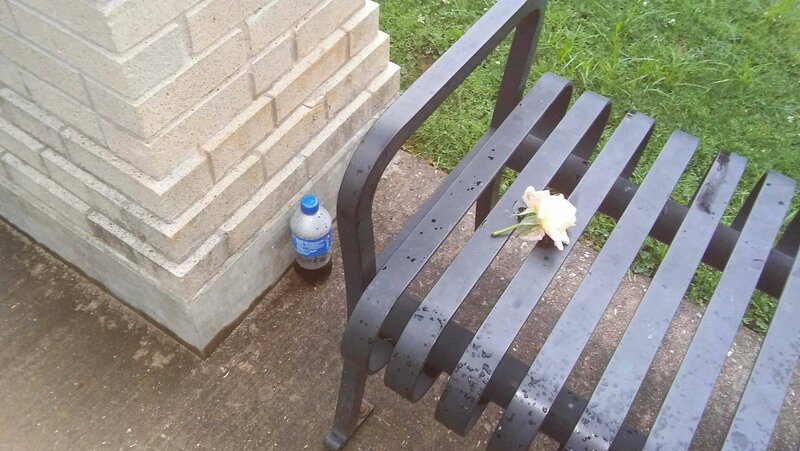 On one of the benches, there sits a single rose. A half-full Pepsi bottle is on the ground next to it. I look around, but don’t see anyone close by. I pick up the flower and hold it to my nose. It smells good, but the end of the stem is starting to brown. It’s been here a while. Forgotten. I picture a couple, walking through here like we are. He breaks the rules and picks her a flower. But why did she leave it behind? Maybe it wasn’t a couple. Maybe it was one person, and the rose held a memory. Maybe a young man walked through here and picked the flower for himself. He sat on the bench while the scent brought him back to times he’d nearly forgotten. Maybe he was so caught up in nostalgia he got up and wandered away through the rest of the garden. Maybe the memories were too bitter and not sweet enough to dwell on. Maybe he set the rose there on purpose, leaving it, his memories, and his soda bottle behind him. I carefully place the flower back where I found it, taking care to leave it in the same way it was. I think about taking the Pepsi bottle with me to throw in the trash, but I guess I’m hoping the person who left it there comes back. For the bottle, the rose, and the memories that shouldn’t be forgotten. could the rose just suddenly appear? park that day. The old woman came closer to Jessica. The old woman stopped and stared at Jessica. rose, handed it to Jessica and then began to walk away. and sat there dumb founded. Is she deaf? Does she speak English at all? The old lady smiled. She handed the bag of roses over to Jessica and started walking. benches that she wanted the roses on. took this to mean that she should place the bag down there. first day that I laid eyes on you, your sad little hot dog on your lap, you didn’t seem so happy. Jessica thought for a minute. Who knew one simple act of kindness could create such an effect. I think chicken is overrated and steak should never need any sauces or spices but I’m not going to judge you if you use it. I might even use a little myself, because a little sauce never hurt anyone. I usually answer the simplest way of saying my favorite color, but I know it’s a very specific shade. You’ll never get it right. Just like the baristas who put my name on a cup. They won’t spell it right and that cup is just going to go in the trash anyway. I’m not sure if I believe in aliens or ghosts or Bigfoot or God or Allah or the great flying spaghetti monster. They could be out there, but I have other things I worry about and I don’t care too much for labels. I’m a Sagittarius. You could read everything there is to know about that but it will just give you vauge prophecy. But I am not vauge and you’ll never understand that fully because you’ll end up like that coffee up. And again, I don’t care too much for labels anyway. My favorite movie is about a girl who runs away from home only to find out what she wanted was right there at her white picket fence. There are days where I relate to that wholly, but there are more days where I think she might not have gone far enough away yet. My favorite holiday isn’t the normal one. The normal one has turned people into an obsession. All they do is want. When all I want is warmth, good conversation and a full tummy. My favorite food is something that while tasting delicious also reminds me of the times my father accidentally cooked it a little too much. Nothing like a little too much char on a dead pig, that’s comfort. I think cars are neat. I like the custom builds and I’ll go to car shows willingly. I can change a tire and was shown once how to change my oil and I might be able to figure that out again. But if you told me your turbo boost needed new spark plugs and your carburetor needed blinker fluid, I’d probably believe you. I’m quirky. I’m shy. I’m out going when the moment calls for it. I read. I write. I game. Board games and card games and video games. I love to discuss important matters and heated discussions. Is a hot dog a sandwich? I’m honest. And I care too much. I automatically assume the greatness in people. I tell you all of this in hopes you’ll appreciate me. But you won’t. Because to you, I am a girl. Just a girl with a pretty face who makes you smile and laugh. You’ll want me by your side to make you smile and laugh. Your friends will be charmed and your parents will be delighted. But you’ll forget that girls also cry and shake their fist at the world. And that will scare you. Girls don’t do that, they smile an laugh. But I am not just a girl. A few weeks ago I made a blog post that simply stated my computer died and anything I wrote from here on out would be short until I got it fixed. I recently had the opportunity to get my laptop looked at by the only professional that I trust with something monumentally important to me. Not only do I have all my stories on there, but I have all my essays from college, countless pictures, a working novel, music… I was heartbroken when I couldn’t get the darn thing to even show the smallest sign of life. So much so, I couldn’t even talk about it, hense the short blurb before. So I had my brother look at the poor thing. Whatever seems to be the issue is “out of his wheelhouse.” Which is saying a lot to me because he’s always been a miracle worker with computer issues in the past. He was, however, able to retrieve my files. So here sits my life’s work on a borrowed external hard drive the size of my hand. What’s this mean now? I’ll be on the hunt for a new device and my own external hard drive. Talk about life experiences and learning not to take something for granted. I know that from now on I’ll be taking extra care to back up my files. I’m urging you to do the same. Go save your life, dear readers. Go now. You back? Did you back up your documents? Good. I’m going to start looking into tablets, my first interest would be the Surface. Just from the short research I’ve done it seems like it would be good for writing on the go. I eventually plan on building a desktop, something that will allow me to do my work and have some fun with video games like my Sims. Until then, something small would do just fine. I’m not going to downright ask for donations but if you’d like to donate to my writing cause I’m sure we could work something out. I’ve gotten this overwhelming feeling that I need to be writing. But there’s two horrible things about that. 1. I have nothing coming to mind. Total writer’s block. 2. The urge always happens when I’m at work and have no means of stoping what I’m doing to write. I need to get a little notebook and jot down small musings when I can. As for the creativity, well maybe I’m just not being stimulated enough lately. I carried my luggage to the car. I did a quick look in the car window to make sure I looked okay. Froofed my hair just a bit. I glanced back at you, starring, smiling. You must have watched me. Your ear to ear grin said it all. I knew I’d be back soon, but it it tinged knowing I have to leave in this moment. “Hey Mom, let’s go check out downstairs.” I stood at the end of a glass hutch filled with Victorian style China. I was anxious. As much as I enjoyed touring these historic homes, it was getting late and we had been on our feet all day exploring this old New England town. I pointed to the stairwell. “It’s not roped off or anything. We have like twenty minutes left, we can make it quick.” I could tell by the look in my father’s eye that he was intrigued. The chance to see something the general public doesn’t normally see excited him. Every house we had been to on our vacation this year he had always asked the tour guide about hidden places, and every time so far he had been shot down. “There’s nothing in the information packet.” My father said. From the bottom of the stairs it looked like the historical society had just been using the basement as a storage area. There were boxes piled high of different pamphlets from different attractions and a few boxes of uniforms. The four of us were crowded in the tight space. When I realized I had to use the bathroom, I said to my family I would be right back. This was one of those old fashioned homes that had an outhouse instead of indoor plumbing. So I made my way up the creepy stairs as I heard my mother getting excited about finding a hidden door. Once I had done my business I made my way back towards the house. I got to the entryway but the door was shut, I juggled the handle but it was locked. Looking at my watch I discovered that it was past closing time, I didn’t think we had been exploring the basement that long. I sat on the porch steps and waited a while for my family. “It’s about time you found us!” He said, smiling. “Where is mom and dad?” I panicked and looked all around. Cars where gone and something seemed off about my brother. “Well come on, I’ll show you.” My brother dropped his popsicle and jumped down from the railing. I walked up the porch steps and watched him disappear into the back door. He didn’t open the door, just walked right through it. He stepped all the way out now and I could see how pale he was. I tried to touch his arm, but mine went right through. My brother didn’t come back. I waited and waited. I looked into the window again and could see no signs of him. If we really were dead, maybe he could only be in or out of the house. I began to pinch and slap myself. I didn’t think that I had died as well, but I couldn’t really remember much after leaving for the outhouse. That’s when it hit me, I ran to where the outhouse was. That’s when I saw my lifeless body, blood spilled out from my neck. It looked like I hadn’t even made it inside to the toilet yet. I looked all around, and couldn’t find any signs of life. All the cars had gone except ours. I went to our little mini van and tried to open the doors with no luck. Dad must still have the keys and he’s stuck in the house. I sat down on the gravel driveway and cried. How long will I be stuck out here, alone? I submitted another story to The Drabble. It’s a neat site. The requirement is all submitions need to be 100 words or less. Click this fancy link here and check my story out there. Also read some other stories and poems by other authors. I have also included my story below. You Didn’t Keep Me Close. You figured me out, but you didn’t keep me close. My quirks, my wants, my wishes. All the appropriate high fives and “want to get some tacos?” to the moments of grandeur gestures. And you found the door with all the secrets but you didn’t want to step inside. Or maybe I kept it locked? Knowing that some day you would leave, like they always do. So now that part of me will still float in your head, the ‘what ifs’ and ‘could haves’ and ‘well, maybes’ will linger. And then there’s me. Stuck here, wondering the same things too.